I was at Michael’s last week and their fall decor section is full of projects waiting to take shape. I’m partial to the craft pumpkins myself because there are SO MANY different things you can do with them. I have them sitting on my shelf above my buffet in my dining area waiting for me to decide what to do. I’ve done spray painted pumpkins before in a chevron design. However, I think this year, I’ll try something different. I’m not sure what yet though! Thank goodness for Pinterest! What would we all do without Pinterest? I found a bunch of easy pumpkin decor ideas for fall that caught my eye. I’ve included the link to the Chevron Pumpkins I made a few years back too. Anddddddd I also have a Pumpkin Crafts Pinterest board. Check it out for even more pumpkin love. Which of these pumpkin decor ideas do you like the best? Some neat ideas for the pumpkins. Can hardly believe Fall is almost here! I love doing craft ideas and the Thanksgiving pumpkins is one that I want to try! And the Bedazzled pumpkins look awesome!! so many great new things to try…..love using our pumpkins for center pieces! Some really neat ideas! I love decorating with pumpkins. I would use a pretend pumpkin for any Fall decorations. I know some people use real pumpkins but it is so hot here in the Fall that real pumpkins go bad very quickly, even with sprays and preservatives. I really like the DIY Menu Pumpkin and the DIY Metallic Pumpkin Planter. There is some pretty nifty pumpkin ideas here, but I’m old fashioned and like my pumpkins just the way they are!! Lots of fun ways to decorate pumpkins. Thanks. My son and his wife painted their pumpkins white and splattered them with glitter and glitter gems for their wedding decorations.They got married last October and the pumpkins were beautiful. I really like the paper mache pumpkins done with napkins too.There are some great ideas here. 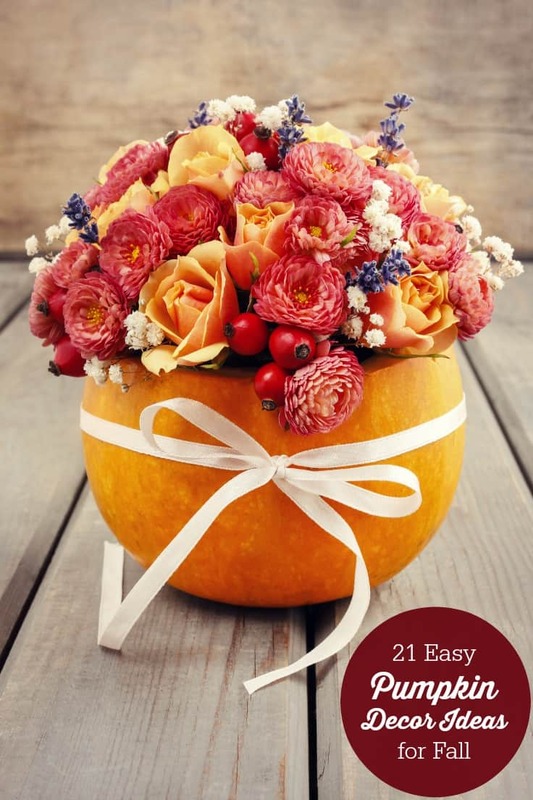 so many cute dyi pumpkin projects.i still love the pumpkin flower arrangement.i love bringing fall flowers into play indoors during fall.the beauty and smells of fall are intoxicating.this flower arrangement is on my must do list. Thank you so much for including our gold leaf diy pumpkins! Thanks for this great post on pumpkins.